Wow- what a December! I couldn't quite fit AOTM in my schedule, but I'm back full force for the new year. January goes to Chuck Waldroup of High Point, NC. Chuck submitted his work through GreenHill's online submission process and I knew immediately that he'd be a great fit in The Shop. I chose Chuck because he makes quality work and has a great eye for character- all of his pieces are beautifully unique. As you read below, you'll learn that woodworking takes a mountain of patience and a truckload of follow through (excuse the pun). Woodworking is a lifestyle and it's intriguing to learn what all goes into it. Where did your love for wood come from? My love of wood dates back to my early childhood. My dad always had a woodshop and allowed me to be underfoot and “work” alongside him when I was a boy. I mostly played in the shop, but as I grew he fostered my creative process and eventually taught me to use the big boy tools. Through my childhood, I made most all my Christmas gifts for grandparents, aunts, and uncles. The genuine appreciation they showered on me for those crude pieces fueled my desire to keep making new things. What is the salvaging process like? It’s actually one of my favorite parts of the process. I consider it kind of like hunting Easter eggs for adults. You have to keep your eyes open for any activity which might provide fresh fallen trees – wind storms, road construction, land development, landscaping, etc. Finding trees which are down does not guarantee you can easily find the owner of the property and/or get access to the wood. Once you have secured access to the material, the wood salvage process becomes very dirty and hard work, but that’s actually what I like most about it and its when the fun begins– I’m outdoors, running a chainsaw and getting some great exercise. Is there a certain time of year that is better for salvaging wood? Trees are available throughout the year, but I prefer to get any large quantities of material in cooler months of the year. The physical demands of salvaging wood in are more intense during warm weather months and the wood itself has a shelf-life. Since the decay process occur more rapidly in warmer temperatures, cooler allows me more time to determine how to use the material. Are there any tricks to salvaging wood that you have learned along the way and want to share? Keeping my eyes open and being assertive in the pursuit has allowed me to score some really nice material. Some of the nicest stuff I’ve used in the last couple years has come within eye sight of the roads near my home. Most people are happy for you to take the trees off their hands if they know how you are using the material. You have to learn to salvage material selectively – experience will guide you and which trees are suitable for your work. I would also recommend developing relationships with other folks who are in the same craft. A good sized tree can provide more material than one artist can use and it is much safer and efficient if more than one person tackles the salvage work. Teamwork is a wonderful thing! Do you have a favorite wood to work with? I like maple. It’s plentiful, cuts cleanly, rarely cracks during drying, can have great character/chatoyance and there are several types of maple trees in NC. Tell me a little about your process. With the wood hauled to the shop, the focus shifts to achieving the best use of the wood from perspective of appearance, function and size. During the planning phase, I seek to emphasize the natural character of the raw material. Uniqueness is assured when I can capture irregular grain patterns, bark inclusions, and natural voids in the piece. I focus on creating forms which are visually appealing and balanced, enhance the beauty of the wood and are pleasing to the touch. Once a plan has been developed, a chainsaw is used to rough-cut the wood and prepare it for further shaping. With the wood on the lathe, traditional turning tools (gouges, chisels, etc.) are used to form the object. Since the item originates from wet wood, it must be properly handled and stored after turning to allow it dry before it can be finished. Depending on the design, many objects are turned/carved a second time in the dry state before they will be finished. While I lean toward some favorite shapes and designs on the lathe, the process of surface embellishment and carving allows me push the envelope and craft works which go beyond the norm and might be viewed as original and/or artistic. When the shaping and sanding process is complete, substantial effort is invested to apply a finish which is unique to the intended application of the object. When you see my work, please don’t hesitate to pick it up – I hope it provides an appreciation for the care and creative effort invested in it! My intent is to produce high quality items which folks are proud to own, use and/or display in their homes. What is the longest you have spent making a piece and what was it? I’ve created a few pieces which involve 90% free form carving. Carving on a complex project can be tedious and time consuming to the extent I prefer to work on them for an hour here and there. For some of these pieces, I’ve worked on them for well over a year. 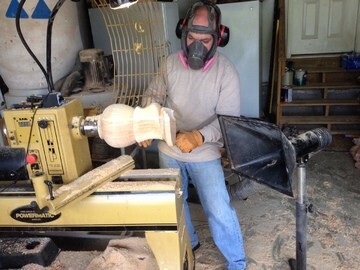 Are there any woodworkers that have inspired you in the making of your pieces? My local woodturning club, Piedmont Triad Woodturners Association, has had a major influence on me. There are also several professionals in the Southeast US who have inspired and/or taught me including Alan Hollar, John Jordan, and Chris Ramsey. However, my dad has probably been the one of my biggest sources of inspiration in the last five years. 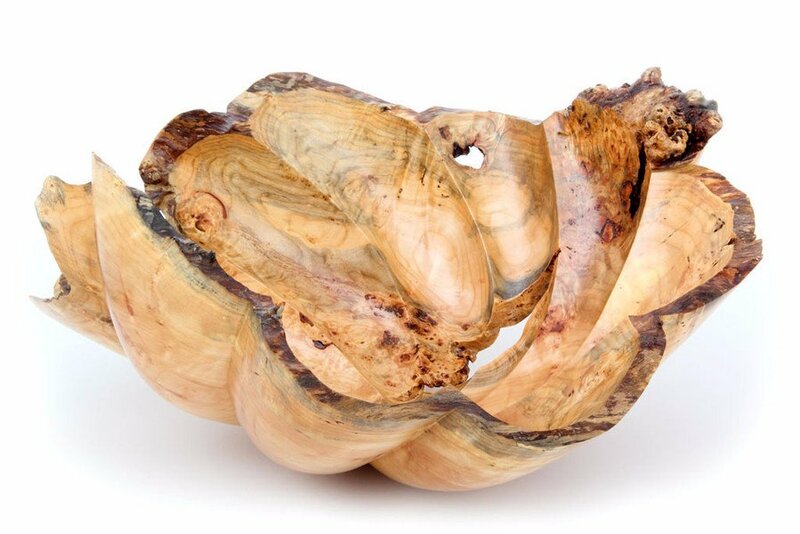 His skills in woodturning and wood-sculpting evolved at an amazingly rapid pace. Woodworking is a shared passion for us which has strengthened our relationship. We’ve been able to collaborate and conceptualize techniques and designs that I would likely not have attempted on my own. 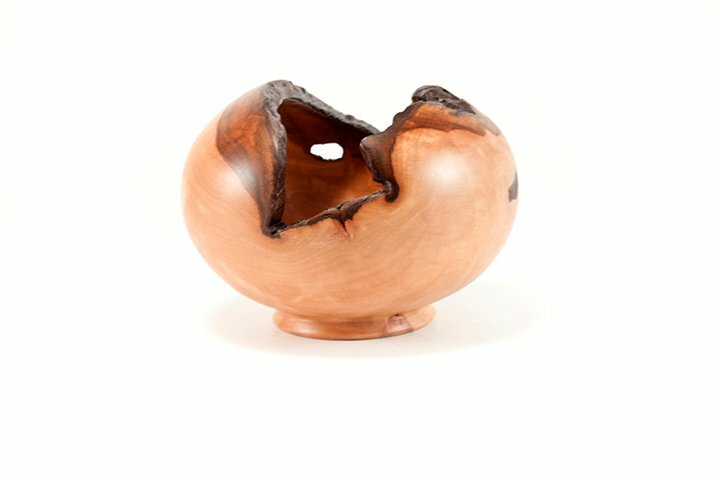 A lifetime of exposure to woodworking and related craft has evolved into a passion for sculpting wood into unique items which are functional and/or decorative. The uniqueness of the items I create begins with the raw material. The majority of the work originates from selectively salvaged wood which might otherwise be destined for the local landfill or used as firewood. 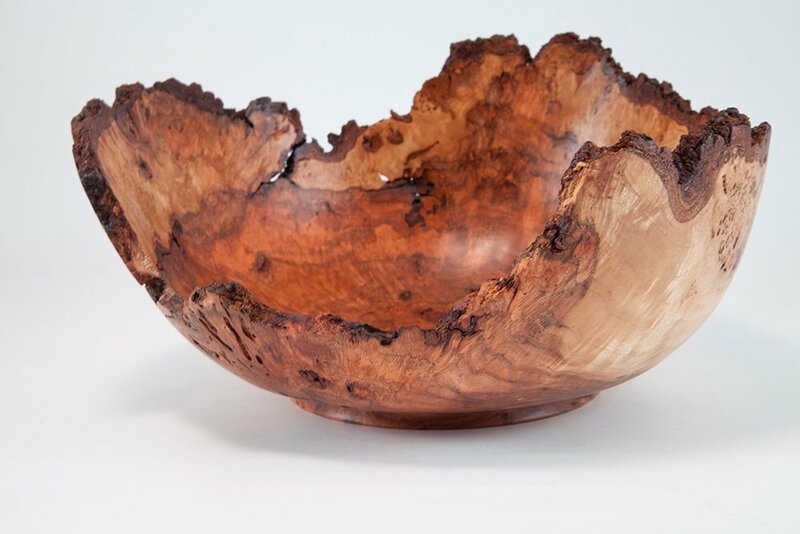 It typically starts with rough, green wood in log, burl or root form; the trees which provide the raw material are primarily North Carolina hardwoods, most of which originate when they fall during storms, or are removed due to age/disease or for clearing of land. The source of the material and the scrutiny and labor which goes into acquiring the wood helps assure the finished work will be one of a kind. Visit The Shop at GreenHill to stay abreast of NC art. For more information on Chuck Waldroup please email Toni Tronu.